eBook PDF (100 Pages, 2.75 MB), Kindle, etc. Windows Azure SQL Reporting provides a flexible platform for managing and viewing reports. Its cloud-based architecture means that its services are instantly scalable for any number of users - adding and removing servers through Windows Azure is significantly simpler than managing on-site servers - and maintenance costs are kept to a minimum. 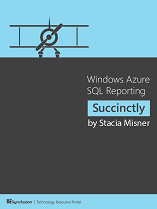 With Windows Azure SQL Reporting Succinctly by Stacia Misner, you'll learn how to set up a SQL Database server, migrate your existing data to the cloud, design report items, and deploy complete reports to the server. Instruction is also provided for managing user roles and creating reusable report parts.